I love studying pictures of bookshelves when people post them on their blog or Facebook or Twitter. I love being able to zoom in and see what is lurking in the shadows. Recently former blogger Polly posted a picture of her shelves on Facebook and I was excited to see that she and I have the same Faber edition of the Alexandria Quartet. Savidge Reads has his series Other People’s Bookshelves which is up into the 70s at this point. And then Stuck in a Book and I bonded over Phyllis Rose’s book The Shelf–although my initial enthusiasm waned while Simon’s waxed. So today, I start a new series in which I am going to post each of my bookshelves, one at a time, and largely in alphabetical order. If I’ve done my sums correctly there should be 35 installments. Make sure you click on it. Plenty of room to zoom. I have not had very good luck with Peter Ackroyd, but I am always on the lookout for novels with a classical music theme. I pretty much buy any Virago/Dial paperback. I absolutely loved the first two Adiche’s I read. Half a Yellow Sun is devastating. I’m not sure I will like this book. The prose poem, Knoxville Summer of 1915 with which the book opens is the source/inspiration for my original blog My Porch. I think this are some of her ghost stories. I’ve never read any of her work. Don’t know anything about this one. For some reason I have been buying pretty much any used book I come across from the Hogarth Press. As you can see, I am an Ambler fan. Bookseller John in Houston turned me onto Ambler’s books, and as you can see, I’ve become a fan. Of those I have read so far, State of Siege and A Kind of Anger are my favorites. It is possible that von Arnim is one of those authors where the first book I read I loved and subsequent novels, not so much. The Enchanted April is wonderful. Love was good, but not a delight. The Caravaners (not pictured) was a DNF and Elizabeth and Her German Garden (not pictured) was a little tedious when not talking about the garden. A fantastic read and a little crazy. The title of this caught my eye but I knew nothing about the book or author. Her Wikipedia entry is fascinating. And she was prolific. I could be on to something good. There will be more Atwood in the next installment. The first three listed here, however, are my absolute favorites. You can read them separately, but even better to read them in order and in succession. You have hit upon an oddly fascinating idea. I loved it and await your next post. Have you read Alias Grace? It’s one of my favourite books of all time. Sad to hear about Anita Brookner. Back in the 90’s I couldn’t consume her novels quickly enough. This sort of thing is like crack to me. Lyn at I Prefer Reading has done a similar thing, shelf by shelf. How funny about The Caravanners, which is one of my favourites of hers. Love this idea … Favorite on this shelf is Enchanted April. Love this idea! I do hope you keep trying trying with von Arnim. Of the ones left unread on your shelves, I think you might really enjoy The Pastor’s Wife. Such a fun thing to do! I look forward to seeing them all. I don’t have, nor have I read, any of the books on this shelf. My books aren’t in alphabetical order, but I probably don’t have as many as you. My V. Woolf are altogether, as are my Wodehouse, and John Mortimer. Most of my nonfiction is together, and my mysteries are mostly in one place, but other than that there is no order. I find I rather like it because I enjoy looking around and being surprised – seeing a book I haven’t thought about in ages. I have a similar approach to CDs. If they were all in order, you wouldn’t need to search, you’d see and find only what you were looking for, and there would be no serendipitous re-discoveries – which are one of the great joys of life! Oh, and I have the Faber AQ, too. I keep thinking I would like to reread it. I love this idea. I wish everyone would do this. Looking forward to the next one. Also good luck with the garden. I, too, love this idea! Oryx and Crake – I read that, didn’t much care for it, but I recognized the genius of Margaret Attwood, and that prompts me to read her again. Looking forward to the next installment – but there’s no hurry! 1. Do you have read and TBR shelved together? How do you remember what you’ve read?? 2. 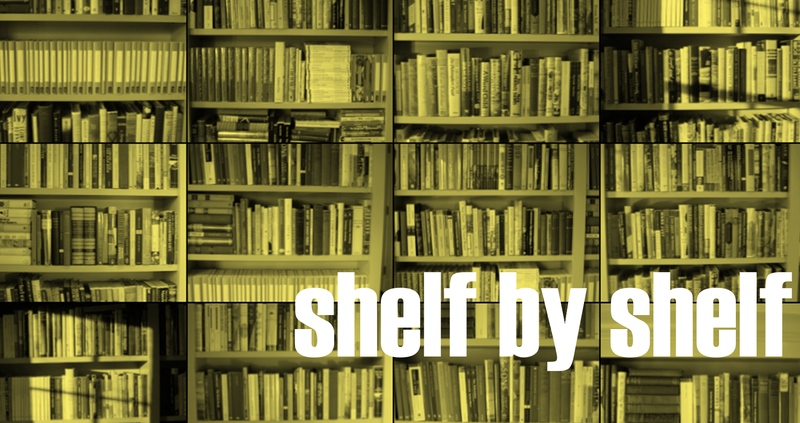 Do you have fiction and non-fiction shelved together? What a lovely shelf! The first thing I do when visiting is cast surreptitious (actually – probably fairly obvious!) glances at people’s books to see what they have. Alias Grace is one of my favourite Atwoods – wonderful! Great idea for a series! I’ve read – and enjoyed – two of these books: Purple Hibiscus and The Enchanted April. I would like to read more Adiche and Atwood (I’ve only read The Blind Assassin). I’ve not read a lot of Louisa May Alcott, but a favourite book of mine that I’ve kept with me as I’ve moved residences over the last 20 years is An Old Fashioned Girl. I think you’d enjoy it too. Because you like old fashioned feminine storylines, and the main character, Polly, makes her living as a piano teacher. It’s a charming nice read if you get the chance/time. I love this idea! I recently alphabetized most of mine and it makes life a lot easier (there are a few collections I’ve pulled out). I can’t wait to see what else you have on your shelves! Great idea. I’ve never alphabetized my books before, I tend to group them by genre, author and series, but this makes me want to rearrange again.